In this episode I spoke with Whitney Beatty, the CEO of The Apothecarry Case. 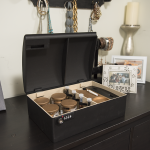 The Apothecarry Case is crafted from the finest hardwood and uniquely designed to organize everything you need in one place — safely and secured with a duel combination and key lock so kids and petes are being kept safe. The airtight Apothecarry case is separated into two sections to prevent odors like resin from cross-contaminating your fresh herbs. One side to host your strains, dabs, and oil canisters, and a separate side that holds your rider, tools, papers, pipes, and vaporizers.